Politics, political rulers and their political trajectory decide what China is today and tomorrow. The constitutional amendment removing the presidential and vice-presidential two-term limit at the recently held 13th National People’s Congress (NPC) of China will allow Xi Jinping,1 supposedly the most powerful leader in Chinese political history after Mao Zedong, to hold office for at least another term after his second term ends in 2023. With this, he may emerge as the longest serving leader in the post-Mao period.2 In March 2013, Xi Jinping had assumed the position of President of China during the 12th NPC. In the Chinese political system, the powers and authority of the president primarily derives from the concurrent posts of General Secretary of the Communist Party of China (CPC) and Chairman of the party’s Central Military Commission (CMC), which Xi was already holding before becoming President in March 2013. This issue brief examines the implications of Xi Jinping’s extended tenure for India-China relations. The constitutional amendment to do away with the presidential and vice-presidential term limits is a major development in Chinese political history. This was only the fifth occasion since 1982 that the constitution has been amended. Calling the move an “important” development for China’s political course, the Chinese state media clarified that it did not mean a change in the retirement system for party leaders and officials. It in fact termed the amendment a progressive move that would facilitate China’s rise under the leadership of the CPC.3 The amendment, importantly, incorporated Xi Jinping’s Thought on “Socialism with Chinese Characteristics for a New Era”,4 which is to be gradually achieved by establishing a “moderately prosperous society” by 2020, a great modern socialist country by 2035 and, eventually, a strong China by the middle of the 21st century. Equally important is the fact that the amendment has been incorporated into the charter of the Chinese People’s Political Consultative Conference (CPPCC), an advisory body of the CPC,5 thus implying that Xi’s thought is central to both the party’s and China’s future path. Theoretically, Xi’s continuation into a third term as president would mean a strong and institutionalised authoritarian regime with the full backing of the People’s Liberation Army (PLA) and the CPC over the next decade. It indicates a unified leadership in times to come. It further implies that civil-military relations will be stable and Xi Jinping will continue to enjoy undisputed leadership in the civilian and military domains. In constitutional terms, the removal of the two-term limit for the president effectively establishes parity between the office of the President of China and that of the Chairman of the CMC and General Secretary of the party.6 The last two positions do not have any term limit in the constitution. As a result, the removal of the two-term limit for the position of president will allow all three significant offices to symbolically hold equal weight in China’s complex civil-military structure. There is widespread speculation that Xi might continue to hold power as the Chairman of the CMC and perhaps as the General Secretary of the CPC beyond 2022-23. Both are important positions that influence the Party’s supervisory process in China’s political structure. Politically, this will give Xi Jinping a free hand to assert his leadership and the CPC’s supremacy without running the risk of allowing any other potential leader to challenge his leadership in the near future. Xi’s appointment of retired Politburo Standing Committee member Wang Qishan as the new Vice President of China, while simultaneously amending the constitution by removing the two-term limit for the vice presidency, is indicative of his agenda.7 Wang Qishan has been a close and trusted associate in Xi’s anti-corruption drive. Though the position of vice president is largely a ceremonial one, Xi appears determined to empower it so as to benefit from Wang’s support in running the country. This constitutional amendment, with its centralisation of power, is being seen in some quarters as a serious setback to China’s legal and political system, which is in need of massive reform. For instance, Li Datong, a well-known journalist in China, commented in WeChat that this development would “subject us to the ridicule of the civilised nations of the world” and will pull China “backward into history.”8 On the other hand, this amendment was seemingly carried out keeping in view domestic imperatives. The economy has been under stress for some time, and the rate of growth of the gross domestic product (GDP) has slowed down considerably, which the Chinese leadership has turned to calling the “new normal”. In 2016, the economy grew at the rate of 6.7 per cent, which was the lowest growth rate since 1990.9 At the same time, Xi Jinping’s flagship Belt and Road Initiative (BRI) needs long-term nurturing since its main intent is to revitalise the economy and revive a higher growth rate through international economic engagement. Thus, under these circumstances, a long-term leadership will provide stability to the system. Besides, there are other domestic issues including the anti-corruption drive that need a long-term action plan which only a strong leadership under Xi can evolve and implement. The constitutional amendment further implies that political reforms are becoming secondary in China. Civic participation and freedom of the people are becoming subordinate to the CPC’s political culture of managing the country not by the “rule of law” but through arbitrary rules set by the rulers. With this, there seems to be a return to an authoritarian culture in decision-making. China had moved away from an authoritarian culture in the post-Mao period, adapting slowly to the collective and institutional decision-making process. In contrast, until his death, Mao had made all the crucial foreign policy decisions, including his decision to wage war on India in 1962. The foreign policy bearing of Xi’s extended presidency is enormous. Basically, it guarantees the continuation and evolution of major initiatives including the BRI over the next decade or so. Here, it is important to note that as part of Xi’s “new era” strategy, since his ascent to power in 2013, Beijing has been pursuing a multi-layered and multi-pronged foreign policy. “Bringing-in” and “going-out” are two important components of this policy.10 “Bringing-in” involves inviting foreign delegates and hosting grand summits and events, while “going-out” means overseas visits of the top leadership through an intensive outreach programme involving the signing of deals, undertaking cooperative programmes and promoting investment abroad. Thus, as part of the “bringing-in” initiative, Xi Jinping hosted the fourth Conference on Interaction and Confidence Building Measures in Asia (CICA) in May 2014; Asia-Pacific Economic Cooperation (APEC) summit in November 2014; Group of Twenty (G20) summit in September 2016, the BRI forum in May 2017; BRICS (Brazil-Russia-India-China-South Africa) summit in September 2017; and a military parade to commemorate the 70th anniversary of the victory over Japan in World War II in September 2015. The year 2018 will witness China hosting the Shanghai Cooperation Organisation (SCO) summit in Qingdao. And as part of the “going-out” campaign, Xi Jinping travelled to more than 50 countries across five continents in his first term, which included a visit to India in 2014. Significantly, Xi has visited the headquarters of major regional and international organisations and has delivered speeches, including at the World Economic Forum (WEF) in Davos in 2017. These suggest that China pursued an active foreign policy during Xi’s first term as president. This active foreign policy, combining “bringing-in” and “going-out” initiatives, is being pursued within the architecture of four foreign policy propositions: “a new type of major power relationships”; “major country diplomacy with Chinese characteristics”; “a community of common destiny”; and a “new type of international relations”. Each of these propositions engages with smaller and bigger countries across the region and the world differently. But the main Chinese strategic ambitions behind these propositions are twofold: (a) enhancing China’s position globally as a leader equal to the status of the US; and (b) taking a leadership role in international affairs, with a particular focus on the Asia-Pacific. The Chinese proposition of the “new type of major power relations” goes back to 2012 when Xi delivered a speech in Washington to characterise Sino-US relations in times to come.11 Xi’s appointment of Wang Qishan as vice-president indicates the importance that is likely to be given to the relationship with the US. Wang is China’s most experienced and seasoned politician on US affairs and is known as Beijing’s “America hand”.12 His return to power indicates that the Xi administration’s foreign relations strategy will be more US-centric, within the construct of Xi’s “new type of major power relations”. While aiming to enhance its status vis-à-vis the US, China’s immediate focus will be on the Asia-Pacific region where Donald Trump has created a vacuum through his withdrawal from the Asia-Pacific multilateral trade grouping. China sees this as a strategic opportunity for its rise as a world power. Xi’s extended term as president and his “new era” foreign policy will therefore aim to take advantage of this American retreat by focusing more on the Asia-Pacific region. With Xi at the helm for another decade, one is likely to witness a continuation in China’s Asia-Pacific strategy. The return of the Quadrilateral initiative involving Australia, India, Japan and the US will only reinforce China’s focus on the Asia-Pacific region. Major countries in the region, including India, might find China’s growing strategic ambitions challenging. It might even encourage some countries in the Asia-Pacific to revisit their policies towards China. Donald Trump’s unclear Asia policy does not hold out any assurance, which might eventually encourage many Asian countries not only to rebuild their relationship with China but also to see China as an opportunity.15 For instance, Japan, an alliance partner of the US, has recently shown an inclination to improve relations with China. The recently re-elected Shinzo Abe has even expressed “conditional support” to China on the BRI and a willingness to engage with China under the initiative to improve bilateral relations. A similar trend is visible on Taiwan’s part too. The ruling Democratic Progressive Party (DPP) under Tsai Ing-Wen is not pursuing the same nationalist and ‘pro-independence’ policy as it did during its previous stint in power from 2000 to 2008. In South Asia, too, a similar trend can be noticed with many smaller countries engaging with China. The key to the “great rejuvenation” plan is continued economic growth for promoting the CPC’s national and international stature. Debate will continue as to whether China will eventually succeed in meeting these targets, but it is becoming evidently clear that Xi’s tenure as President of China is crucial to the country’s future path. 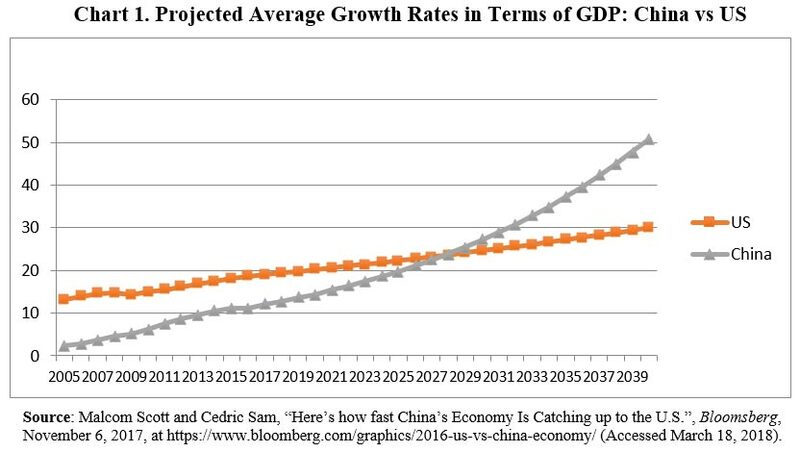 Going by the current GDP growth trend, it is estimated that the Chinese economy will surpass that of the US by 2027-28 (see Chart 1). This is the period when Xi Jinping will supposedly be finishing his third term. However, this projection has been carried out without taking into account the effect of the BRI on China’s economic performance. If the BRI starts offering even partial success, the Chinese economy will be in an even more sound position by 2027-28. It is important to note here that since the BRI’s initial announcement in 2013, China under Xi’s leadership has pursued an intensive national and international campaign promoting its merits. If Xi’s first tenure from 2013 to 2018 were to be seen as the phase of “promotion” of the BRI, the second term, 2018-2023, would mark the phase of “execution”, with Beijing signing a range of projects and deals with various countries in Asia and the world. The BRI’s success is therefore key to the CPC’s and China’s future since it will provide an impetus to Chinese economic growth apart from addressing other domestic economic problems. Therefore, Xi Jinping would like to ensure that the BRI starts returning results and helps in sustaining domestic economic growth. That means, Chinese foreign policy will become more BRI-centric in the years to come where infrastructure investment abroad, promoting connectivity and corridors and forging stronger trade and economic contacts with the outside world will be the main aspects of its “going-out” strategy. This will pose an even more severe test for India in the neighbourhood, and in Asia at large, than what New Delhi is facing at present. Xi’s emergence as the strongest leader in the post-Mao period is certainly not an encouraging development. However, India should not treat this development negatively in its entirety, particularly in the context of boundary negotiations. Engaging with a strong leadership to find a solution to the boundary dispute is a better proposition than struggling to find a solution under a weak leadership. However, territorial integrity and national sovereignty are two subject matters that any country finds difficult to compromise on, including an authoritarian China. Thus, a nationalist China is unlikely to make any concessions on matters relating to the boundary or national security, no matter who is in power. But India should not be pessimistic about this. Rather, under these circumstances, India should welcome the boundary negotiation with China and try to carry forward the negotiation process with prudence, focusing instead on the advantage the continuity in leadership presents. Engaging in sustained negotiation with the same leadership is a better proposition than trying to renew a negotiation process under a new leadership. It is important to mention here that officials under Xi Jinping had initially indicated a preference for “oriental wisdom” to resolve the boundary dispute. It remains unclear what this “oriental wisdom” really means, but the Chinese proposition is basically about finding a ‘political’ solution within the ambit of the “Panchsheel” – the Five Principles of Peaceful Coexistence – where the leadership in India and China will play a significant role in resolving the boundary dispute.17 Essentially, it implies that the boundary dispute between the two countries must be resolved through a ‘political’ understanding. Keeping this in perspective, Xi Jinping’s extended presidency should encourage India to see the boundary negotiation process in a fresh context. In Xi’s first term as president, neither did the boundary negotiation witness any positive development nor was it pursued continuously at the Special Representatives (SRs) level. Yang Jiechi, the Chinese interlocutor for the SRs dialogue, was elevated as a politburo member at the 19th National Congress. Both Yang Jiechi and the current Foreign Minister Wang Yi are two important officials in the Xi Jinping administration with rich experience in handling Asian affairs. Now, Wang Yi has been elevated to the position of State Councillor after the 13th NPC and could be the new interlocutor for the SRs dialogue. Recently, Wang Yi stated that India and China should not “fight but dance with each other”, offering a positive picture of India-China relations.18 India must perceive these developments positively. Overall, India should carefully understand the evolving foreign policy strategy of China under Xi Jinping, and notably, his worldview, and try to position bilateral relations accordingly. The foreign policy strategies and worldviews of each of the previous Chinese presidents have been an integral part of China’s relationship with India. Unlike Mao’s authoritarianism, Deng Xiaoping’s approach largely pursued modest engagement through an “open-door” foreign policy where the focus was on expanding China’s foreign relations across the world.19 As a result, during Deng’s tenure, India-China relations normalised, even though the credit for normalisation should primarily go to India’s diplomatic and political outreach to China through then Foreign Minister A.B. Vajpayee’s visit to China in February 1979 and then Prime Minister Rajiv Gandhi’s visit in 1988.20 Under Jiang Zemin and Hu Jintao, China’s foreign relations strategy turned towards “greater conservatism”, mainly emphasising on domestic economic growth and linking it with amicable relations among countries around China’s periphery and elsewhere.21 China’s overall approach towards India was to build confidence during the tenure of Jiang Zemin, when a range of confidence-building measures (CBMs) primarily in 1993 and 1996 was signed in order to offer a new momentum to bilateral relations after the normalisation process. The bilateral relationship became even more institutionalised during Hu Jintao’s presidency, when a plethora of agreements, memorandums of understanding (MoUs) and continuous political exchanges at the highest level became the highlights of India-China relations. In brief, Xi Jinping’s extended Presidency should be seen as a strategic opportunity for India-China relations. New Delhi must act proactively to improve the envisioned “developmental partnership” between India and China, primarily formulated during President Xi’s visit to India in September 2014. A reciprocation from China regarding the same will obviously be required. The essence of this developmental partnership is to forge closer economic contacts. Post-Doklam, during the Xiamen BRICS summit, Narendra Modi and Xi Jinping expressed interest in having a “forward looking constructive” relationship to nurture ahead this developmental partnership. Both sides should therefore focus on how to develop this developmental partnership while improving overall bilateral relations. On India’s part, this should be carried out proactively without overlooking the changes and challenges that Xi’s extended presidency brings to the region and the world in general. 1. “Amendments proposed for Constitution”, China Daily, February 25, 2018, at http://www.chinadaily.com.cn/a/201802/25/WS5a927386a3106e7dcc13dece.html (accessed on March 24, 2018). 2. The office of the President of China was first established in 1954 and then abolished in 1975. It was again reinstated in the Chinese Constitution in 1982, but with reduced powers. The position of “Chairman” has been the most powerful position in Chinese political history. The office of the President of China is closely linked with those of the General Secretary of the CPC and chairman of the CMC. For further reading on the subject, see, Susan V. Lawrence, “China’s Political Institutions and Leaders in Charts”, CRS Report for Congress, November 12, 2013, at https://fas.org/sgp/crs/row/R43303.pdf. 3. “Commentary: China Is Rising. Get Used to It”, People’s Daily, March 7, 2018, at http://en.people.cn/n3/2018/0307/c90000-9434046.html (Accessed March 18, 2018); also see, “China’s Party System Is Great Contribution to Political Civilization: Xi”, People’s Daily, March 5, 2018, at http://en.people.cn/n3/2018/0305/c90000-9432835.html (Accessed March 18, 2018). 4. “Incorporation of Xi Jinping Thought into Constitution Conducive to National Rejuvenation”, People’s Daily, February 26, 2018, at http://en.people.cn/n3/2018/0226/c90000-9430280.html (Accessed March 23, 2018). 5. “Proposed Amendment to CPPCC Charter Unveiled”, Xinhua, March 8, 2018, at http://www.xinhuanet.com/english/2018-03/08/c_137025376.htm (Accessed March 16, 2018). 6. Christopher Bodeen, “China Abolishes 2-term Limit, Allowing Xi Jinping to Rule Indefinitely”, Time, March 11, 2018, at http://time.com/5194739/china-abolishes-term-limits/ (Accessed March 18, 2018). 7. “Wang Qishan Elected Vice-President of China”, Xinhuanet, March 17, 2018, at http://www.xinhuanet.com/english/2018-03/17/c_137045280.htm (Accessed March 18, 2018). 8. Li Datong is a well-known journalist and known for being critical of the CPC. He was formerly an editor of Freezing Point of the China Youth Daily, a widely circulated Chinese newspaper. He posted an open letter to the Chinese public through WeChat on February 26, 2018. The translated letter can be accessed here: David Bandurski, “Li Datong’s Open Letter”, China Media Project, February 28, 2018, at http://chinamediaproject.org/2018/02/28/li-datongs-open-letter/ (Accessed March 16, 2018). 9. Katie Allen, “Chinese Growth Slips to Slowest Pace for 26 Years”, The Guardian, January 20, 2017, at https://www.theguardian.com/business/2017/jan/20/chinese-economic-growth... (Accessed March 1, 2018). 10. Xie Tao, “Chinese Foreign Policy with Xi Jinping Characteristics”, Carnegie Endowment for International Peace, November 20, 2017, at http://carnegieendowment.org/2017/11/20/chinese-foreign-policy-with-xi-j... (Accessed March 17, 2018). 11. David Lampton, “A New Type of Major-power Relationship: Seeking a Durable Foundation for U.S.-China Ties”, China & US Focus, September 21, 2013, at https://www.chinausfocus.com/foreign-policy/a-new-type-of-major-power-re... (Accessed March 18, 2018). 12. Tom Mitchell, “Xi Jinping Ally Wang Qishan Confirmed as New China Vice-president”, Financial Times, March 18, 2018, at https://www.ft.com/content/aa260008-28d3-11e8-b27e-cc62a39d57a0 (Accessed March 18, 2018). 13. China’s Policies on Asia-Pacific Security Cooperation, State Council Information Office of the People’s Republic of China, First Edition, January 2017, at http://www.xinhuanet.com/english/2017-01/11/c_135974121.htm (Accessed March 24, 2018). https://www.whitehouse.gov/wp-content/uploads/2017/12/NSS-Final-12-18-20... (Accessed March 24, 2018). 15. Dylan Loh Ming Hui, “How Xi Jinping’s ‘Lifetime Presidency’ Could Change China – For Better or Worse”, The Conversation, February 27, 2018, at http://theconversation.com/how-xi-jinpings-lifetime-presidency-could-cha... (Accessed March 17, 2018). 16. Xi Jinping, “Secure Decisive Victory in Building a Moderately Prosperous Society in All Respects and Strive for the Great Success of Socialism with Chinese Characteristics for a New Era”, Speech Delivered at the 19th National Congress of the Communist Party of China, October 18, 2017, at http://www.xinhuanet.com/english/download/Xi_Jinping's_report_at_19th_CPC_National_Congress.pdf (Accessed March 19, 2018). 17. “Interview with Chinese Ambassador Le Yucheng by PT”, News from China, September 2014, pp. 20-21; “Full Text of Li Keqiang’s Speech at Opening Ceremony of Boao Forum”, Ministry of Commerce, People’s Republic of China, April 14, 2014, at http://english.mofcom.gov.cn/article/zt_boaoforum2014/news/201404/201404... (Accessed March 18, 2018). 18. “Chinese FM Calls for Mutual Trust with India”, Xinhua, March 8, 2018, at http://www.xinhuanet.com/english/2018-03/08/c_137024429.htm (Accessed March 24, 2018). 19. Several books and articles written on Mao and Deng explain this. For instance, for an analysis of the role of leaders, leadership and their stature in Chinese politics, see: Weixing Chen and Yang Zhong, Leadership in a Changing China (Palgrave Macmillan, New York, 2005). 20. Eric Gonsalves, “The India-China Parleys (1979-1982)”, Indian Foreign Affairs Journal, October-December 2013. 21. Marc Lanteigne, “Who Makes Chinese Foreign Policy Today?”, Chinese Foreign Policy: An Introduction (Routledge, London, 2009), p. 19.